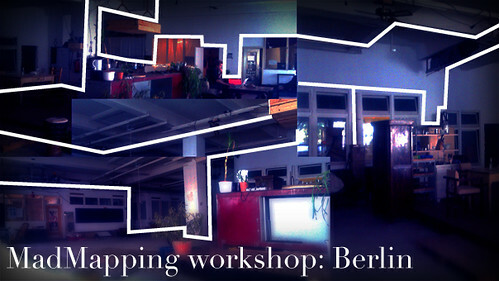 Pedro Zaz of UnitedVJs and I team up again for this second MadMapper workshop in Berlin. We hosted one back in August. People came from all over Europe and we even had someone come all the way from Korea! The focus will be how to use MadMapper using the Syphon enabled VJ software of your choice. We also demonstrate how to use the Spacial Scanner, MAD_lab tools and provide technical/creative feedback. The workshop is 50€. The fee allows us to cover the basic costs, rental of projectors and the space. Only 20 places are available. You will be provided with a time limited license of MadMapper and, optionally, a time limited license of Modul8. But unfortunatly I can’t use paypal as it is not working for my country. Is there a way to settle the 50 euros in berlin? I will be in Berlin from the 3rd to the 10th. Thank you and hope to see hear from you real soon.